Technological advances and federal mandates are changing the landscape of physician documentation and serving as a catalyst to broader HIT adoption. For most physicians, the concept of “time is money” rings true, especially in an era in which most must tighten their belts to keep their practice and interests above water. 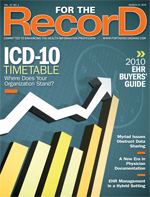 That old adage has resonated across the industry as physicians have considered the larger picture of documentation practices as they relate to EHRs and computerized physician order entry. For years, the healthcare industry has scratched its head in bewilderment as it has watched the average physician resist adoption of more advanced technologies and lag sorely behind the HIT curve where it bends to meet better efficiencies and improved patient care. But according to many industry professionals, times are changing—and changing at a frenetic pace. Newer, more advanced technologies arriving on the scene are expected to catapult the industry toward rapid HIT adoption as they make the documentation process easier, allowing physicians to maintain the efficient and timely workflow they desire. Couple this improved workflow with expectations that enhanced speech recognition will help organizations meet federally mandated meaningful use criteria, and many expect that the way physician documentation is done today will look quite different five years from now. Industry professionals agree that one of the inherent problems to physician involvement in the EHR movement has been the fact that for most it has meant more time devoted to patient documentation—time that most claim they do not have. Add to that the costs involved with adding infrastructure, training, and realigning workflow processes, and many physicians made the strategic decision to put the technological movement on the back burner. Ruthann Russo, PhD, JD, MPH, RHIT, a documentation specialist who works with several leading healthcare organizations, concurs, adding that physician acceptance of the benefits of technology is also growing and will help spur quicker adoption. Many suggest that advancements in speech recognition are being noticed by physicians, who cite the technology’s ability to capture more robust information into the EHR as an achievement that’s been a long time coming. For years, the problems associated with speech recognition technology have centered around its inability to extract appropriate information from unstructured text. With the advent of natural language processing, Silecky says great strides have been made to automate the dictation process through speech recognition whereby needed patient information is extracted from freely dictated text directly into the appropriate EHR data fields in an accurate and efficient manner. Belton notes that going forward, two scenarios will likely play out for physicians and EHRs. In one scenario, documentation will continue to be carried out via traditional dictation methods, and a physician will simply use the EHR for certain functions. “That’s a somewhat effective process. It may be less disruptive [to workflow], but a three- to four-day turnaround for transcription makes for poor patient care,” he says, adding that this scenario will also be the most costly as physicians would continue to pay an average of $10,000 to $15,000 per year for transcription services. The second scenario would entail the adoption of speech recognition technology, essentially eliminating the costs associated with transcription, Belton says. According to Russo, stimulus funds available through the American Recovery and Reinvestment Act (ARRA) have positioned the healthcare field as a strategic focal point for countless technology companies. Many, she suggests, would not have ventured into the space a decade ago. “This transformation started the pre-ARRA introduction of Google’s EHR partnership with Cleveland Clinic and Microsoft’s HealthVault to Dell’s marketing of its Affiliated Physician EMR Solution directly to hospitals,” she says. And the number of mHealth applications available continue to multiply. Russo points to applications such as iChart, which she says “may be the most comprehensive mHealth suite of applications available to physicians.” Others she singles out include applications such as IMedDoc, which captures images and allows physicians to load them into patient records; 1st Followup, providing a method for emergency department physicians to record significant patient information to enable easy follow-up; and Gynotations, a platform designed for gynecologists to record operating room and patient visit notes. Russo cautions that it would not be surprising to find the Department of Justice or the Office of Inspector General seeking out HIPAA violations resulting from individual users of mHealth apps and slapping them with some hefty fines. And while the speed, cost, and user friendliness of these platforms encourages adoption, Russo also notes that a lack of consistent platform makes interface with hospital records more difficult and may result in issues with quality and fragmentation of information. Likewise, M*Modal also recently extended its speech recognition product to the iPhone. While technological advances are driving more widespread adoption of new platforms and processes for physician documentation, the role that these platforms play in helping organizations meet meaningful use criteria may be the catalyst that truly moves the system forward, suggest industry professionals. Last December, the Centers for Medicare & Medicaid Services issued a notice of proposed rulemaking that spelled out parameters governing the Medicare and Medicaid EHR incentive programs, including a proposed definition for the central concept of meaningful use as it relates to EHRs. In order for professionals and hospitals to be eligible to receive payments under the incentive programs provided through ARRA, it is required that they demonstrate meaningful use of a certified EHR system. To meet these criteria, it has been mandated that a specific percentage of all physician orders be done via an EHR and the data must be placed in a structured format. Silecky says new speech recognition platforms encourage physician use of EHRs by eliminating the frustrations inherent in the pull-down menus of the past. Belton says if physicians can easily dictate straight into the EHR and have essential information automatically extracted while at the same time meeting meaningful use criteria, the market will begin to move rapidly in that direction. “That’s the biggest and most exciting breakthrough in the future of documentation,” he says. Alongside that caution, she describes the EHR implementation plan addressed by ARRA incentives to that of a big barge on the river, while mHealth applications are compared with speedboats. “Each serves a specific purpose for its user,” she points out, noting that in the end, it will be the ARRA’s $20 billion treasure chest that will have the largest impact. • ensure adequate privacy security protections for PHRs.